What is a Chase Cover for a Chimney? Modern houses and other buildings usually have prefabricated metal fireplaces and flues, rather than traditional brick and mortar fireplaces with brick chimneys surrounding clay tile flues. The frame that is built around a modern prefabricated chimney is called a chase. The chase is usually constructed of wood framing covered with a skin of siding, masonry or stucco. In high quality construction, the space inside the chase outside the flue will be insulated. The chase cover is the fitting that goes over the top of the chase with a hole in the middle to fit around the top of the flue. Many chase covers are manufactured from galvanized steel, which will resist rust and corrosion as long as they are painted and not subjected to extreme temperature conditions. Many are poorly designed with flat tops that collect rain and snow that does not quickly run off. Heat from the combustion gases coming up the chimney, exposure to intense summer sunlight and corrosive standing water all contribute to peeling paint and rust in cheap galvanized chase covers. When a chase cover shows rust, or when a homeowner notices rusty stains down the side of the chase, it is time to replace it with a new and higher quality cover. Once a cover begins to rust, it will quickly develop holes that let water leak into the chase and down the flue. This water infiltration can cause mold growth inside the chimney and nearby structural parts of the house, it can damage sheetrock and ceilings, it can compromise the insulation, and it can lead to corrosion inside the flue. A high quality replacement chase cover for a chimney is a wise investment that will easily pay for itself in reduced future home maintenance expenses. Chase covers can be fabricated from corrosion resistant materials that will last many decades even under the extreme conditions at the top of a chimney. Stainless steel and copper are popular materials for chase covers that can be purchased with lifetime warranties. You may be able to find off the shelf chase covers that fit your needs by shopping online or at your local hardware store, but you can also have a chase cover custom made at a reasonable cost. A high quality chase cover should be slightly domed or arched on top to encourage water runoff and it should be made of stainless steel, copper, bronze or some other corrosion resistant metal. You can get a chase cover with a chimney cap already built into it in one piece, or you can buy a simple chase cover to seal your chase and around your flue and then select a separate chimney cap to fit your home decorating taste. 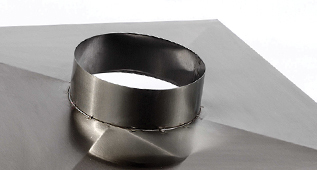 Your chase cover does not have to be a simple cap with a hole for the flue. Some custom chase covers are decorative additions to chimney tops in addition to being an integral part of a safe and efficient home energy system.